Ever get home and have no idea what to cook or are too tired to feel creative in the kitchen? The dutch baby is my go-to quick-fix for these times. A dutch baby is kind of like a fluffy pancake. It’s pretty showy while it bakes which I find very satisfying to watch! Another reason why I love this recipe is it can be sweet or savory and endlessly versatile. 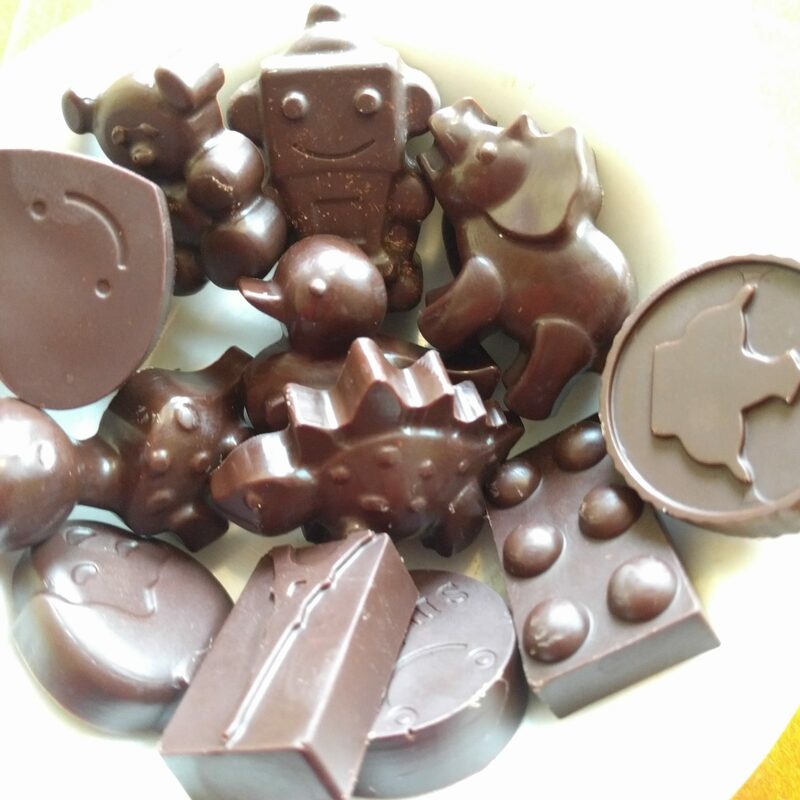 With so many flavor options to choose from, I rarely get tired of eating it! Place an oven-safe heavy 12″ frying pan in the oven and preheat to 425 degrees Fahrenheit. 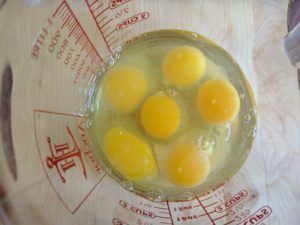 In a large bowl or 4-cup glass pitcher, beat 6 eggs. It is fine if the mixture is a little lumpy at this stage. Whisk in 3/4 cup of coconut milk. Melt 4 Tablespoons of the fat of your choice in the hot frying pan. I love to use duck fat and coconut oil. Try using other fats like pasture-raised lard, ghee, and tallow. 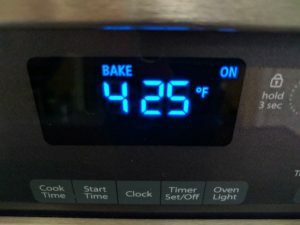 Butter is a little too delicate for the high temperature of the oven. After the fat is melted pour in the batter and promptly return pan to the oven. Make sure to turn the oven light on so you can watch the dramatic rising of the dutch baby! The fluffiness won’t last long. Cut into wedges. Top with sweet or savory options mentioned below. 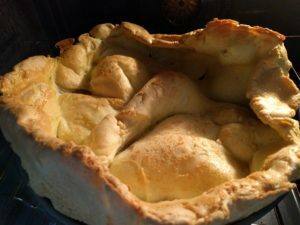 Serve the dutch baby immediately. 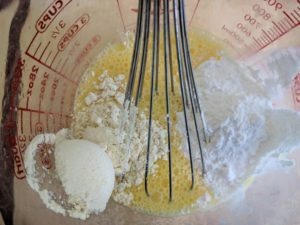 Whisk in arrowroot powder, chestnut or coconut flour, and sea salt. It is fine if the mixture is a little lumpy at this stage. Whisk in 3/4 cup of coconut milk. Add any meat or herbs to the batter now. 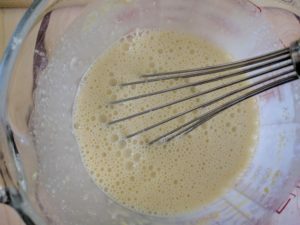 Whisk again right before adding batter to the hot pan. Melt 4 Tablespoons of the fat of your choice in the hot frying pan. I love to use duck fat and coconut oil. Bake for 18-20 minutes until golden. Make sure to turn the oven light on so you can watch the dramatic rising of the dutch baby! Cut into wedges and top as desired. 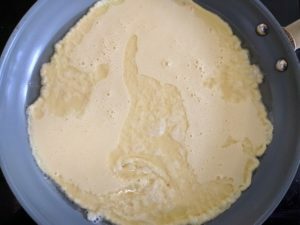 Keep in mind the more extras you put into your batter the less the dutch baby will rise. This will do nothing to diminish the flavor. Leave a comment below and let us know what you’ll add to your dutch baby! Is soap making you look older?